Tummy Tuck with a Body Lift at Cincinnati Plastic Surgery. Full abdominoplasty which required a lower vertical incision in order to remove all loose skin. Notice the large amount of loose skin and stretch marks prior to surgery. 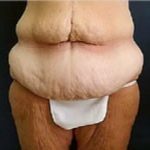 Tummy tuck with bodylift following massive weight loss. 50 pound tummy tuck in a bariatric patient. Standard full abdominoplasty with secondary liposuction. 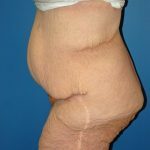 Fleur de lis abdominoplasty in a bariatric patient. Full tummy tuck with no liposuction.